The City of Los Angeles has more than 700 special funds, with a collective balance of $4.1 billion. 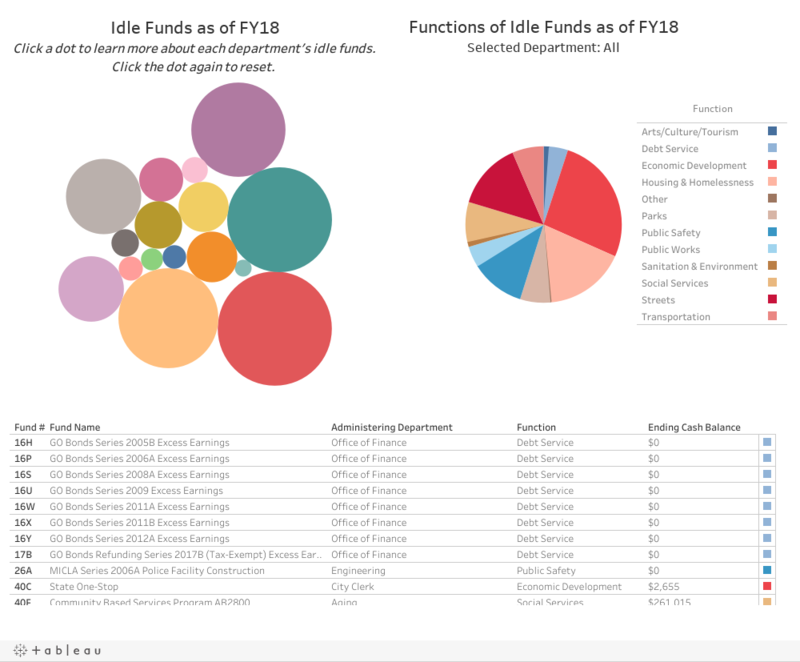 While special funds make up close to half the City’s treasury, nearly 600 funds are not included in the annual budget. Currently, there are no standard policies or procedures for creating, using, reviewing, repurposing or closing special funds, resulting in a tangled web of accounts and a considerable amount of money sitting untouched that could be spent on vital City services. Read the full report here. 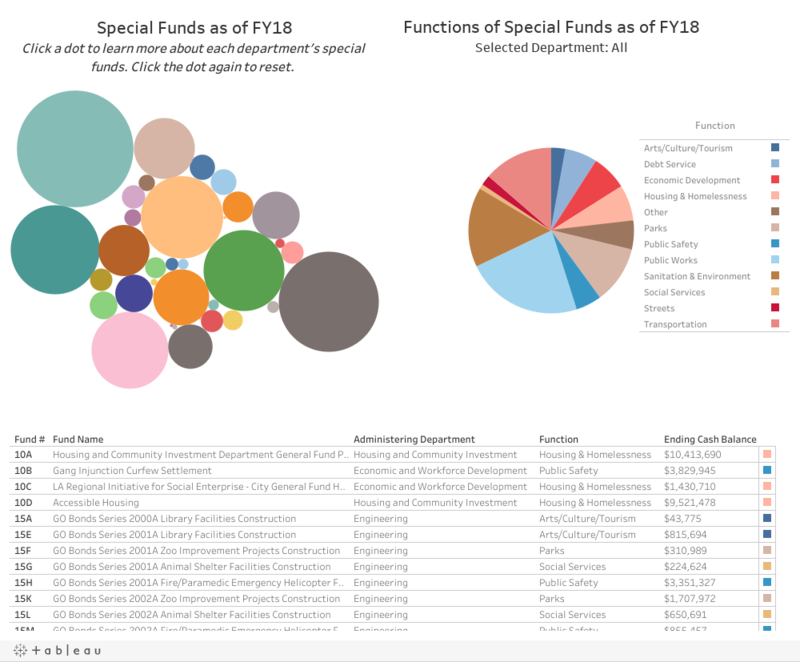 Who manages the City’s special funds? The City’s approach to special fund management is decentralized. Each City department oversees a number of special funds and applies its own rules, with some in charge of many and others very few. Special funds are categorized as fulfilling one of 12 distinct functions. 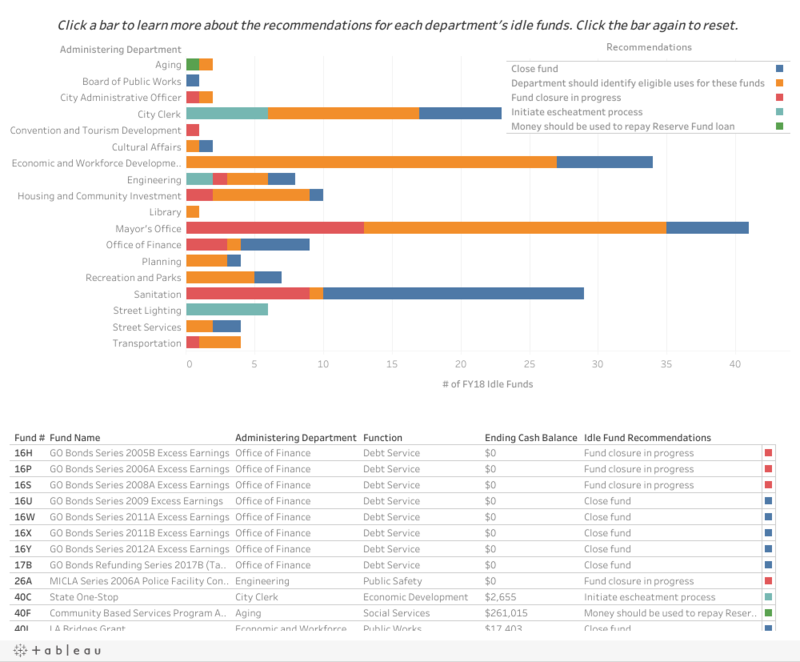 Review where special funds were located and their purposes directly below. All figures reported here are from the end of Fiscal Year 2017 – 18 (June 30, 2018). Full listing of All City Funds for Fiscal Year 2017-18. What about special funds that are not used? If a special fund is dormant with no expenditures for three or more years, it is considered idle. At the end of fiscal year 2018, 188 special funds with more than $31 million were idle. This money could be used to increase City services, including street improvements and public safety.